What if I want my logo used in the product? How do I get it to you and how much does that cost? 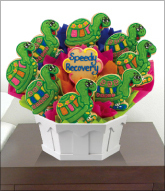 You can request your logo to be added to any cookie bouquet by emailing a 300dpi hi-res jpg format of your logo to gifts@cookiesbydesign.com. There is not an additional charge for this service. Can I be direct billed for my order? Yes we are able to offer direct billing but this offer is subject to credit check. **Payment terms are Net 30** for further information or questions please contact us at 800-347-3110. Can I have the total charged to my credit card, if not how will it be charged? Yes, we can charge your card one time and you will be emailed a final receipt of your order by a Gifting Specialist, (please specify this option upon ordering). You can also choose to have each local shop receiving your order through our program charge your card resulting in multiple charges on your card. We will still provide you with an itemized report of all charges for reconciliation. How will I know how much is charged to my credit card? Upon request a Gifting Specialist can provide you with an Account Recap report. This recap provides a breakdown of how much was charged to the credit card. This recap can be provided as soon as the order is input into our system. Do the Corporate Gifts I see online include delivery? No, there is a flat rate delivery fee of $16 nationwide for any delivery within a 3 day time frame. We do offer express shipping for both overnight ($35) and 2-day ($25) for your convenience. If you are ordering a larger order to one location or need a specific time of day for a gift to arrive please call 800-347-3110 to discuss delivery costs. No, we do not deliver to Canada or anywhere outside of the U.S at this time. However we have 80 locations nationwide to service your needs with most hand delivered. We also do not recommend shipping our arrangements overseas. 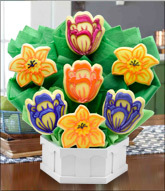 Our cookie gifts are made with very little preservatives and we cannot guarantee freshness. You are welcome to have an item shipped directly to you and you can forward on to its final destination yourself. 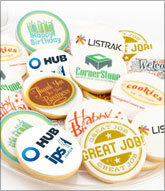 Please check our Cookies by Design locations for specific availability. If I have a problem with my order, who do I contact? Our gift specialists will be happy to help you, should that be necessary. 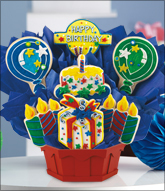 Call us toll-free at 800-347-3110, or email us at gifts@cookiesbydesign.com. An advantage and convenience of the Corporate Gift Program is that there is only one person to contact and only one person will contact you. When I participate in the Corporate Gift program does this mean I am receiving a discount? Yes, the Corporate Gift Program offers consistent competitive pricing, and discounts are available for multiple or monthly orders. What is consistent competitive pricing? Many of our locations are independently owned and operated and they set their own regional pricing. However when orders are placed through our program we provide the same product price & delivery whether your gift is going to one location or hundreds. What if I forget my password for corporate gifting account? 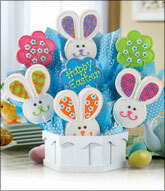 Please email your login username to gifts@cookiesbydesign.com and a Gifting Specialist will assist you with ordering. During the ordering process please select a date at least 4 days from the time you need the order to arrive. Larger custom orders may take longer so please allow at least a 1 weeks’ notice or call 800-347-3110 for additional information.